This is the sexiest shirt a man can wear. Don't believe me? Then have a look at the cover of just about any romance novel ever written. What's the man wearing on the cover? I THOUGHT so! That's right, this is the ever-popular, billowing sleeve Swordsman Shirt worn by the protagonist of just about any period/historical work ever written. 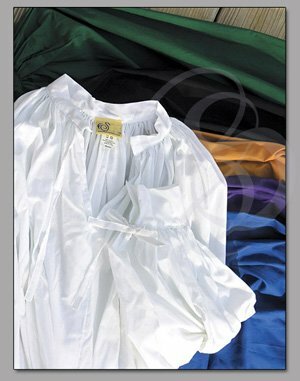 Pirates, Swashbucklers, Soldiers, Musketeers, Nobles, Peasants, Bandits, Knights and just about any other fighting man that you can imagine have at one point or another been portrayed wearing this style of shirt. It is the staple of medieval and renaissance shirt fashion for men (and is growing in popularity among women, too). This Swordsman Shirt is made from a luxurious cotton muslin. It features tie strings at the wrists and neck and is sewn to create the maximum number of folds and billows. The billowing sleeves are perfect for showing through slashed sleeves or simply to add character with no outer garment. The shirt is available in White, black, hunter green, royal blue, purple, and gold. Machine wash, tumble dry. Material: Cotton Muslim. Machine Wash, tumble dry.